This page is or better yet will be a list of all the characters that have been in all the books of Drizzt from A to Z. But for right now we will start with the Dark Elf Trilogy, and fill in the rest in time. Bios were taken from Wikipedia, "A Readers Guide to R.A. Salvatore's The Legend of Drizzt", and my research from the novels and comics. Alustriel known as Lady Alustriel Silverhand or (Elue Dualen) to the elves is a human. She is the former ruler of Silverymoon and now High Lady to the Leaque of Silver Marches. The Silver Marches is a group of states surrounding Silverymoon. They consist of Everlund, Citidal Adbar and Minthral Hall to name a few. She is a powerful mage, and one of the few chosen of Mystra and one of the Seven Sisters. She is highly dedicated to her people, people with political power never shows these signs, which is why she is extremely popular in Silverymoon, and her most of her people will do anything to protect her. Her first encounter with Drizzt initially was meet with judgement, being a Drow, he was not allowed into Silverymoon, not because she was judgemental, but because she knew his presense would cause an uproar. She visited Drizzt as a vision in the night explaining herself to him and putting his torn heart at ease. Thus showing her to be a wise and fair ruler for her people. As Drizzt became more accepted and to many a hero, he has been allowed into Silverymoon by Alustriel. They grew a close friendship over the years and Drizzt has even been allowed to spend time alone in her home, loving her conversasions with him. She encouraged Cattie-Brie in the arts of being a mage, introducing her to the use of a wand during a battle with the orcs. As of the events of the Spellplague, Alustriel, along with six of the other chosen seven sisters of Mystra went missing. They are thought to be dead. Artemis is the worlds most deadly and dangerous assassin, and Drizzt rival and mortal enemy. Artemis is a cunning and very tactical assassin. 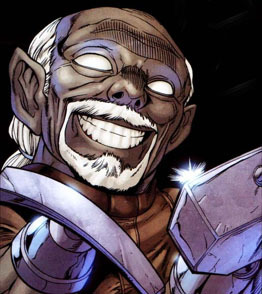 His first appearance was the Crystal Shard, as apart of Pasha Pook's guild, hired to track down Regis the halfling and return his stolen amulet. This is how he first encountered Drizzt his equal. Artemis lived a lonely and cold life, and prided himself at being the best in the world due to the sacrafices he had to make in his life. Seclusion from having family, friends or any relationship what so ever, doing so would make him weak and vunerable. Belwar Dissengulp is a former burrow-warden of the Svirfneblin, another humanoid race in the Underdark. 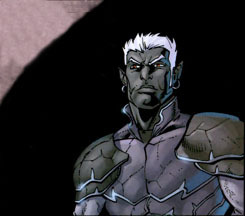 Ten years prior to the events of Exile, Drizzt was part of a raiding party of Menzoberranzan who attacked a mining party of svirfneblin, led by Belwar. Again Drizzt's merciful nature showed, and he convinced his group to let Belwar live (using the excuse that he could serve as a warning to the svirfneblin against venturing so close to Menzoberranzan). However, Drizzt's brother, Dinin, decided to sever both his hands as an example. 10 years pending Drizzt's self-imposed exile, he ventured into the svirfneblin city of Blingdenstone, where he requested to speak with Belwar, who's hands had been replaced with a magical hammer and pickaxe. The former burrow-warden decided to take Drizzt into his home and keep responsibility for him, knowing that he owed his life to him. When Drizzt was forced to leave the city (the city fearing the drow hunting him), Belwar decided to join him in his adventures through the Underdark, and only left when Drizzt told of his intentions to go to the surface. Brister was a human wizard in the underdark sought out by Drizzt and Belwar Dissengulp to save the life of their new found friend Clacker. The evil wizard turned their friend who was once a pech into a Hook Horror. Drizzt threatend to feed him to Guenhwyvar unless he changed Clacker back into a pech. While rumbling through his spell book in frustration made the comment "Wretched pech, I should have killed him as I killed the others." sent Clacker into an angry frenzy killing the wizard before he could be transformed back. Briza Do'Urden was the oldest of three daughters of Matron Malice Do'Urden. A powerful priestess of Lolth, she was angry and brutal, and she always punished infractions quickly. She killed her mother, Malice Do'Urden when she learned that her mother Malice had not successfully completed Zin-Carla, the highest gift of Lolth (Drizzt refers to it as Lolth's greatest lie). She had little time to savor her power, for house Do'Urden was attacked immediately after by house Baenre. She was the last Matron Mother of House Do'Urden, even if only for a few moments, until Jarlaxle killed her himself, stating that he never liked her to begin with. 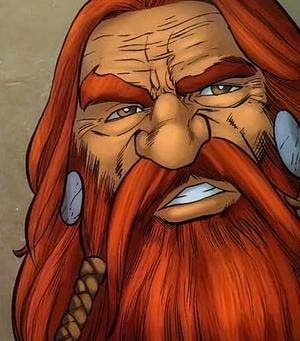 Bruenor Battlehammer is the Dwarf King of Mithral Hall, adopted father to Catti-brie and Wulfgar. First Appearance was in Icewind Dale Trilogy starting with "The Crystal Shard." Bruenor was not always king, he resided in Ten Towns with Catti-brie, Regis and the new comer who resided in the outskrits of the towns...Drizzt. It was not until Bruenor's battle with Akar Kessel who welded the crystal shard, that he later decided to search for the long lost hall. His tricking Drizzt into helping him was the smartest move he could have made. Catti-brie's mother died in childbirth, and her father moved with his daughter from Mirabar to Termalaine, one of the Ten Towns. For three years, he was quite successfulï¿½but then a goblin ended the man's life. All of Termalaine might have fallen to a goblin onslaught but for the dwarves of clan Battlehammer rushing from their valley to turn back the horde. Bruenor himself saved the orphan girl from death. When the smoke cleared, he claimed Catti-brie as his adopted daughter. Catti-brie was the first person in the Icewind Dale to accept Drizzt, although she was very young when Drizzt came to know her. Catti-brie possesses a stubborn and tough dwarf personality due to her foster-father. 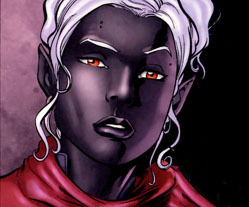 Catti-brie was one of the Companions of the Hall, and had a tentative, on-off romance with Drizzt through many of the books. This tension finally culminated in The Two Swords, when Catti-brie and Drizzt finally became lovers. These seven-foot-long arachnids live in the dark corners of the Underdark, where they hide in the tops of caves and tunnels. They hang long strands of strong webbing to snare passing creatures, including humans and drow, though they prefer bats and other flying creatures of the Underdark. Once a victum is ensnared in these sticky webs, cave fishers use their powerful, lobsterlike claws to drag their prey up into hungry mouths. 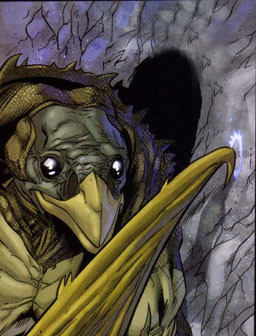 In a pinch they'll fire strands of webbing at creatures who have envaded their trap lines, dragging them back like a man with a fishing line- hence their name, cave fishers. Though they're often encountered on their own, they also live in clusters of up to four individuals, who cooperate in trapping, killing, and eating. With the ability to drag as much as four hundred pounds up their trap lines, few creatures are big enough to be safe from cave fishers. Clacker is a pech, who is transformed into a Hook Horror by a human wizard. Under the effects of this spell, he forgets his name, much of his past, and eventually his mind begins to transform into that of a mindless beast. He meets Drizzt and Belwar Dissengulp as they journey through the Underdark. The three sought the wizard that cast the spell on Clacker; however, Clacker unwillingly killed him when a comment from the wizard drove him into a primal rage from his Hook Horror instincts. He eventually has a moment of resurgence, where he becomes more in-tune with the earth than a regular pech. He uses his abilities to save his friends, and then asks them to kill him before he completely turns. 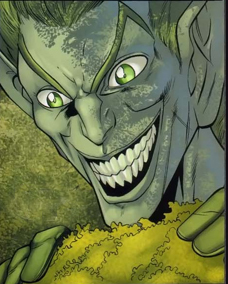 He is killed by Zaknafein, and his body, having returned to its true form, is placed into a pool of acid..
Dahlia is an elf warrior first seen in the Gauntlgrym series.She is with her vampire lover Hector Dor'Crae, and is tasked by the Red Wizard of Thay lich Zuikir Szass to go to create a Dread Ring. This is an enchanted area that produces countless undead minions. 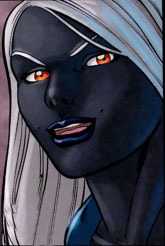 She is charged to go to Luskan in order to investigate possibilities. There are several flashbacks of Dahlia as a child and the cruelties she suffered at the hands of Netherese barbarians and demons. She was raped by the barbarians and impregnated by the tiefling Herzgo Alegni and forced to bear his demon offspring which she killed soon after it was born while she was still a child herself. Dahlia is an exceptionally talented warrior and uses the break staff weapon, Kozah's Needle. This is an eight-foot-long staff that can be broken into four two-foot sections attached by a chain. The break staff can be configured in many ways. It also allows the owner to summon lightning during battle. She also wears diamond studs as a tribute to her lovers. Eight are in her left ear to signify lovers she has murdered and one in her right ear for those who have so far escaped that fate. Before leaving on her mission, she kills her former lover Themerelis, a powerful ranger wielding a greatsword. This angers her rival Sylora Salm as she was also Themerelis' lover. She eventually joins Drizzt trying to make up for her wrongs, by helping to free Gauntlgrym from the fire primordial, and stopping Dor'Crae from tormenting Pwent in his new vampire state. 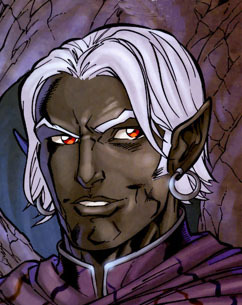 Dinin is brother of Drizzt Do'Urden, first appearing in R.A. Salvatore's Dark Elf Trilogy, beginning with the first book Homeland, following in the second book Exile, and returning in the Legacy of the Drow series' first book The Legacy. In House Do'Urden's war against House DeVir in the opening chapters of Homeland, Dinin unwittingly saved his younger brother's life by murdering his older brother Nalfein, thus making Drizzt the Secondboy of House Do'Urden rather than the Thirdboy. 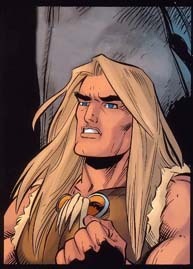 Dinin was also a master of Melee-Magthere until the beginning of the Do'Urden-Hun'ett conflict. When House Do'Urden was destroyed by House Baenre he was spared by Jarlaxle under the conditions that he join the mercenary band Bregan D'aerthe. 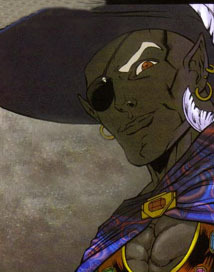 He was a trusted ally of Jarlaxle until he was turned into a drider by his sister Vierna. 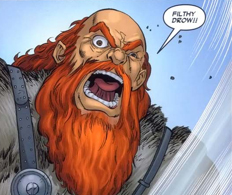 In Vierna's raid on Mithral Hall, Dinin (in his drider form) was killed by Bruenor Battlehammer. Only high-level priestesses in good standing with Lolth are able to initiate the transformation of a dark elf into a drider. This transformation is very painful, and lasts at least 12 hours. Driders develop a poisonous bite. Their digestion changes and they must drink blood of living creatures for sustenance. Driders still maintain the spells and special abilities they had developed as a drow. There can exist any character class of drider. They retain intelligence and memories. This usually makes them bitter, spiteful creatures. Some hunt for magic powerful enough to undo the transformation. Driders appear sexless due to bloating, but able to magically reproduce. Driders seem to retain their gender and characteristics after the transformation, but fertility is debatable..
See Drizzt's bio within the Companions of the Hall Bio's Page. Alton Devir was the last surviving member of House Devir which was slaughtered the night of Drizzt birth, Gelross Hunett the original Faceless One tried to kill his student ending the house. But Masoj intervened and killed Gelross teaming with Alton replacing him as the Faceless One by burining his face with Acid. Alton survived long enough to want revenge against House Do'Urden, but failed by the blades of Drizzt. Gelross Hunett was hired by Denin Do'Urden to kill his student Alton Devir during the fall of House Devir by the hands of House Do'Urden. Gelross failed due to the interference of his student turned cleaning steward Marsoj Hunett who killed Gelross The Faceless One forming an aliance with Alton Divir. Drizzt first encountered a group of gnolls when he first got out of the Underdark. It was known to him that gnolls were used as slaves by some in Drizzt former home of Menzoberrenzan. When he encountered them, they mistook him as a friend, for Drows were well known for their cruilty and evil ways. They wanted Drizzt to join their group in killing a family of humans. Once Drizzt learned of their plan, turned on them and killed them. Guenhwyvar is never not by Drizzt side, and is his most loyal and faithful friend. Guenhwyvar is a magical creature that once belonged and was being used by a drow sorcerer Marsoj. Guenhwyvar's home is inside a stauette, simular to the genie in the bottle. 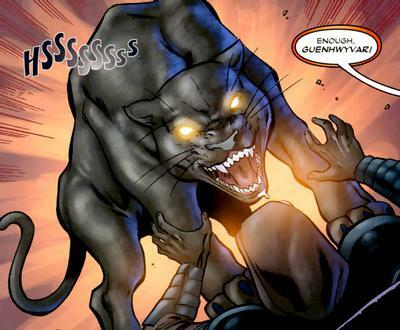 It was not until Drizzt took the statuette killing the Marsoj that allowed him to summon the panther, from the astral plane. Guenhwyvar has been with Drizzt ever since, saving him and rest of the group time and time again. But after all the years of being around them Guenhwyvar is still not favored by King Bruenor as he gets nervous whenever the large cat is around. 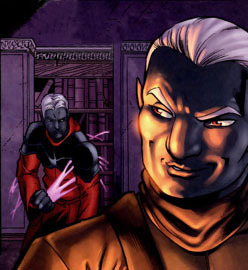 Master of Lore, Trainer at the Academy within the Hall of Instruction, that all Drow warriors must go through for fifty cycles, learning the heratage of the Drow culture, teaching hate and distrust and how to become expert killers. Drizzt was the best due to the training of his father, and Hatch Net could do nothing to turn Drizzt away from the morals and values that he placed within himself. The hook horror is an aberration that stands about nine feet (274 cm) tall and weighs almost 350 pounds (160 kg). It has a mottled grey exoskeleton, which is extremely thick and dense, and as difficult to breach as metal armor. Instead of hands/paws/claws, its front limbs end in 12-inch-long (30 cm) razor-sharp, blade-like hooks. These hooks are, of course, the hook horror's primary method of combat. Its legs are similar to those of a bird, and its head is shaped like that of a vulture, including the hooked beak. Its eyes, however, are multifaceted like that of an insect. It is thought that the hook horror is distantly related to the cockroach, despite its bird-like qualities. Hook horrors have their own language, communicating in a series of clicks and clacks. In a cave, this eerie sound can echo a long way and can be used to estimate cavern sizes and distances, much like the sonar of a bat. Kelnozz of House Kenefin.He was Drizzt first leason in the distrust of his people as Kelnozz acting to befriend Drizzt in the academy, but quickly betrayed him to get the upper hand in training. They became bitter rivals during that time, with Kelnozz always being second best to Drizzt. Lolth, the evil demon Queen of Spiders worshipped by the darkelf Drow society of the Underdark. Also known as the Queen of the Demonweb Pits. 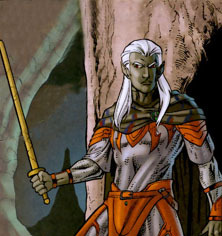 Lolth has been around as a Forgotten Realms character long before the Drizzt books. Lolth was first mentioned in the modules Descent into the Depths of the Earth (1978) and more fully described in Vault of the Drow (1978), and was the main antagonist of the module Queen of the Demonweb Pits (1980). 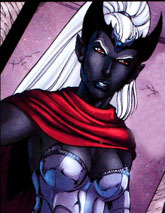 According to the Forgotten Realms storyline, Lolth began as an intermediary goddess abiding in the sixty-sixth layer of the Abyss, the Demonweb Pits. She later transformed herself into a greater goddess, with the Demonweb Pits becoming its own plane. 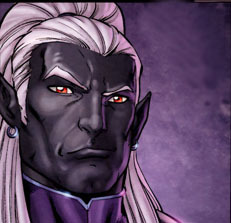 But more specifically in Drizzt's world, he was born as a sacrafice to Lolth as the third male born of House Do'Urden. But with the murder of Nalfein making Drizzt secondboy of House Do'Urden sparring his life to Lolth as a sacrafice. Drizzt spent his entire life in the underdark defying Lolths every wish, first by not only refusing to participate in the Ceremony of Graduation that required him to mate with a High Priestess of Lolth, but speaking ill of Lolth in the process. Then during a hunt above ground against a group of elves, Drizzt lied to his drow brother saying he partook in killing the innocent elves when he did not. This caused wrath with Lolth and brought disfavor on House Do'Urden leaving them wide open for an attack by another house. And Drizzt's mother Matron Malice needed Drizzt dead to sacrafice to Lolth once again. 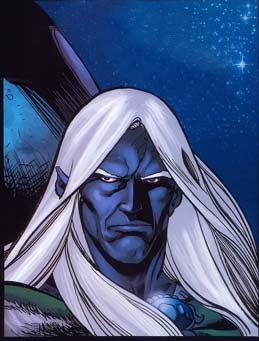 But Zaknafein, the father of Drizzt willingly took his place as that sacrafice, clearing Drizzt off the hook. But when Drizzt discovered what happend to his father, became enraged cursing Lolth, leaving, pushing himself away from House Do'Urden forever, becoming not only an enemy of the house, but an enemy of Lolth as well. Wizard of House Hunett, and original keeper of Guenhwyver. Masoj killed his Master the Faceless One Galross Hunett to team with Alton Diviri. Together they both tried to bring down Drizzt, but failed. Yvonnel Baenre, called for centuries simply Matron Baenre, embodies the House in the city of Menzoberannzan with an uncanny strength bred from deceit and ambition. Still, in the Underdark where the most evil of creatures lie, there are none who would not shudder at the fury of the "Spider-Kissers" being turned on them. 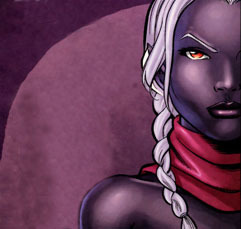 She is described as being the most powerful drow matron mother to have ever lived in Menzoberranzan and even in her old age she is known to be one of the most magically protected beings in Faerï¿½n. 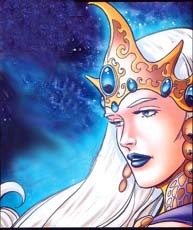 More than two thousand years old, Matron Baenre has had twenty children (15 daughters and 5 sons) and has maintained the relatively enormous power of House Baenre for centuries. After the drow ranger Drizzt Do'Urden wreaks havoc on House Baenre when escaping from its prison chambers, Matron Baenre convinces the other drow houses to assault Mithral Hall in revenge. 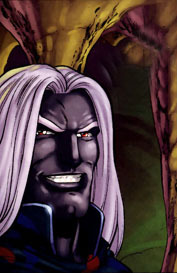 During the assault, Matron Baenre comes across Drizzt and his companions, and by lucky chance Bruenor Battlehammer slays Matron Baenre after a summoned Tanar'ri exposes a shard of antimagic left over from the Time of Troubles, sending the beast back to the abyss and dispelling Matron Baenre's magical defenses. Matron Ginafae Devir was of House Devir, the first to fall by Matron Malice of House Do'Urden. She was killed along with the rest of her clerics at the hand of Zaknafein, famed Weapon Master of House Do'Urden. Malice Do'Urden was Matron of House Do'Urden until her death. She was a strong priestess and had favor of Lolth for a long time. She is the only known user of the power of the birth against her enemies. She was the mother of Drizzt, Dinin, Nalfein, Vierna, Maya and Briza. She also had to adopt SiNafay Hun'ett. She first fell out of the favor of Lloth because of Drizzt's actions on the surface raid. She regained temporarily the favor of Lloth by sacrifing Zaknafein as an atonement. She again lost the favor of Lloth after Drizzt's departure from Menzoberranzan. Malice never regained Lolth's favor but was given a final chance by Lloth to regain her favor by destroying Drizzt by the use of Zin-carla. She received the power for this spell by sacrificing SiNafay. 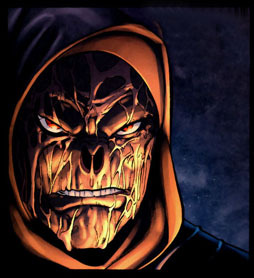 She lost control of Zin-carla for a moment, which was enough time for Zaknafein to destroy himself. This caused Malice to forever lose the favor of Lloth and to be killed by Briza, in one last futile desperate attempt to regain Lloth's favor for House Do'Urden. Malice had six children through three different males: the father of Briza is unknown, Zaknafein was the father of Vierna and Drizzt, and Rizzen was the father of Maya, Nalfein, and Dinin. When Malice's mother died, Briza, Zaknafein and Nalfein where still young, and Malice had just finished her clerical studies. She was Matron House Hun'ett for a long time. Thinking House Do'Urden posed a threat, she attacked it with help of Bregan D'aerthe. 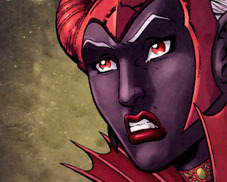 With Jarlaxle's betrayal, her house was defeated and punished by the ruling council of Menzoberranzan. After that, Matron Hun'ett became a member of House Do'Urden under her new name, Shi'nayne Do'Urden. 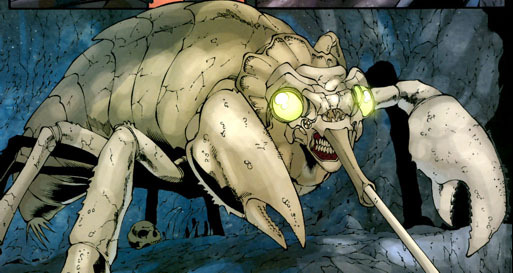 She was tricked and sacrificed to Lolth to summon Zaknafein by using Zin-carla. 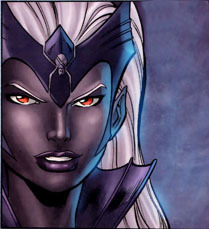 Maya Do'Urden was the youngest of three daughters of Matron Malice Do'Urden; She was a powerful priestess of Lolth. She was slain by House Baenre troops. 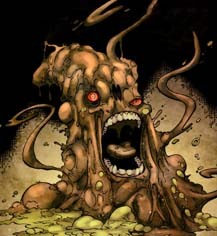 Mind Flayers also known as illithids are monstrous humanoid aberrations with psionic powers. They live in the moist caverns and cities of the Underdark. Illithids believe themselves to be the dominant species of the multiverse and use other intelligent creatures as thralls, slaves, and chattel. Much like Lolth, Mind Flayers have been around the Dungeons and Dragons lore long before the Drizzt books, Mind Flayers have been written as far back as 1975. Drizzt had his first encounter with these creatures during his adventures in the Underdark with Belwar Dissengulp and Clacker. Drizzt was captured by them and thier psionic powers and taken to their city as a slave. While being hunted by a dead Zaknafein who was possessed by Lolth's Spirit Wraith and being controlled by Matron Malice. The Mind Flayers failed at controlling Guenhwyvar and the great cat created a huge amount of chaos in the city looking for Drizzt and killing thier god, freeing Drizzt, Belwar and Clacker from their trance. Zaknafein also played a part, since being dead, would not succomb to the Mind Flayers and killed them in numerous quantities in his pursuit of Drizzt. Once the elderboy of House Do'Urden, he was a powerful wizard and a great asset to House Do'Urden. 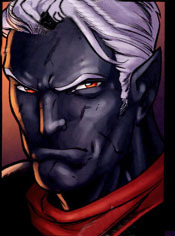 On their attack on House DeVir, while Malice was giving birth to Drizzt, he was betrayed and assassinated by his brother Dinin, who wished to become Elderboy himself. He was accepted as an appropriate sacrifice instead of Drizzt that night, saving the young baby's life. Regis the Halfling or better known as Rumblebelly a name he's called by from Bruenor. This little halfling has been around since the begining with the Crystal Shard. Regis is the typical halfling who hates to fight, loves to eat and rather just stay out of strife all together. Before he met the group he was an admirable thief, if it was not for his theiving ways he may have never met the rest of the group. He was the patron of Matron Malice Do'Urden until his death, in which Malice tricked Rizzen into engaging the spirit-wraith Zaknafein in a fight, when he was promptly hacked to pieces. Malice claimed that it was no great loss as she had already chosen her next patron from amongst the soldiers of House Do'Urden. Rizzen was also the patron of House Do'Urden at the time of Drizzt Do'Urden's birth, though it was common knowledge that he was not the father of Drizzt. He was the known father of Nalfein, Dinin and Maya. McGristle was never a smart man in the traditional sense, he could not read or write, but he made up for it in treachery.With his large axe called Bleeder, he has become an exceptional bounty hunter and fur trapper. When Drizzt was framed for the murder of the Thistledown family, McGristle was brought in to track down and kill Drizzt for a handsome bounty. Drizzt fought McGristle and slayed one of his two hunting dogs. During the battle he lost his ear as he dropped a tree on himself. From then on he made it his soul purpose to kill Drizzt, even when he knew deep down that Drizzt did not kill that family, his hate for him told lie after lie convincing others that Drizzt was a murderer. McGristle joined a Dove Falconhand and her group of hunters to track down Drizzt. Once they were convinced that Drizzt was innocent, he went as far as seeking aid from an Orc Cheiftan, Coroak the Great Winter Wolf and Tephanis the sprite, stirring up more lies, making Drizzt seem like a threat to them all. After he failed with their aid tracked Drizzt all the way to IceWind Dale stirring up the people of Ten Towns and invoking the rage of Bruenor Battlehammer as he laid hands on his adopted daughter Cattie-Brie. Knowing Drizzt was no killer did not fear Drizzt's threats at him, and though defeated returned the threat at Drizzt. But when Bruenor came into the picture, McGristle had no doubts that the angry dwarf would kill him for touching his daughter. McGristle left Ten Towns and never returned. 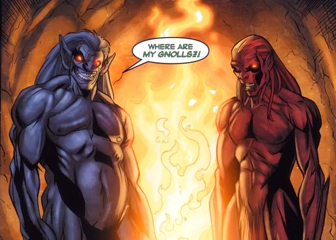 Tephanis is a quickling, a form of sprite, who was summoned by Ulgulu his master a barhest, to help set Drizzt up to take the fall for all the murders that has been happening. Once Drizzt killed Ulgulu and his brother Kempfana. After he learned of his master and protectors death, Tephanis joined Caroak the Great Winter Wolf, telling him of Drizzt and his alliance with the Ranger Montolio DeBrouchee. Who Caroak found both to be a threat and to be dealt with by teaming with an orc king and Roddy McGristle in trying to kill Drizzt. Tephanis told one too many lies to McGristle, and was killed by him. 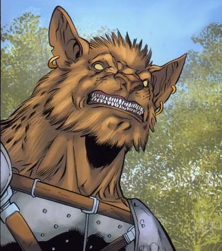 Drizzt unknowingly created enemies of these creatures when he first went above ground and killed the Barghest servants known as gnolls to save a human family the gnolls were going to kill, and likley bring their bodies back to the barghest. Ulgulu was the older and stronger of the two brothers, near maturity and sent out from his plane of Genhenna to the human world to mature and grow with his brother Kempfana. The Brothers had been feeding off the humans of Faerun for months, living up in the mountains fifty miles north of Sundabar. And once they learned of Drizzt, deviced a plan to have their servant Tephanis the quickling make Drizzt the scape goat for all the murders in the area including that of the Thistledown family who Ulgulu killed using Drizzt's form. Thier plan worked for a while, causing Drizzt to be hunted down by Roddy McGristle. Drizzt found Ulgulu with help from his interregation of Tephanis the quickling. Drizzt and Guenhwyvar killed both brothers. Vierna Do'Urden was the second sister of Drizzt Do'Urden, younger than Briza but older than Maya. Her mother was Malice Do'Urden and her father was Zaknafein Do'Urden. She is Drizzt's only full sibling, his other siblings being half-siblings, children of Malice and Rizzen, instead of Malice and Zaknafein. Vierna is the only one of his three sisters for whom Drizzt felt any affection, because he recognized that, like him, she had inherited small goodness in her from Zaknafein. She was Drizzt's primary caretaker when he was a child, and alone of the rest of the family, she could sometimes show some kindness to Drizzt. Becoming a priestess of Lolth made it impossible for her to break free of the evil of the drow and Menzoberranzan like her brother Drizzt would. In The Legacy, the first book of the Legacy of the Drow series, Vierna had descended into Lloth-inspired madness; she turned her half-brother Dinin Do'Urden into a drider and joined the forces of Jarlaxle to hunt down Drizzt, with whom she had become obsessed. She failed, however, and Drizzt was forced to kill her in self-defense. See Wulfgar's bio within the Companions of the Hall Bio's Page. Zaknafein Do'Urden (pronounced zack-NAY-fee-in), famed Weapon Master of House Daermon N'a'shezbaernon, was Drizzt's father, his mentor and his dearest friend. It was he who gave Drizzt the courage to leave Menzoberranzan. He not only trained Drizzt to become an excellent warrior, he also played a great part in shaping his personality, protecting Drizzt from the brutality of Menzoberranzan for as long as he could. 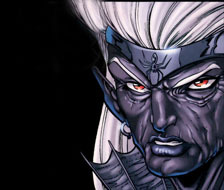 Zaknafein Do'Urden was an excellent warrior, considered the finest in Menzoberranzan, but most importantly, he attempted to refute the evil of drow elves. 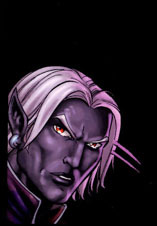 He saw the cruelty of the drow, but could do little to stop it, apart from mercy killings. He did his best to live by his principles, in a world where greed overcomes compassion and ambition overrules all. He had a mysterious friendship with Jarlaxle, leader of Bregan D'aerthe, but it is revealed in Road of the Patriarch that he was in some way betrayed by Jarlaxle. Zaknafein was sacrificed to Lolth by Matron Malice when House Do'Urden fell out of Lolth's favor. Upon discovering this, Drizzt left Menzoberranzan for the wilds of the Underdark. 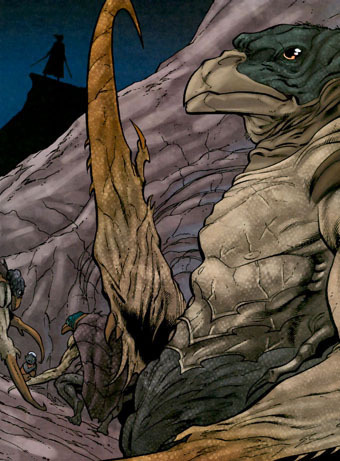 Zaknafein was later brought back through Zin-carla to hunt Drizzt in the Underdark. The spirit-wraith found Drizzt and fought him in a cavern where there were walkways over a pit of acid. Ultimately, Zaknafein fights through the mental barriers, and hurls himself into the pit of acid to prevent himself from killing Drizzt. Years afterward, Drizzt learns that someone he thought lost became a prisoner of the demon Errtu. Assuming that it was his father Zaknafein, he set out to rescue him. 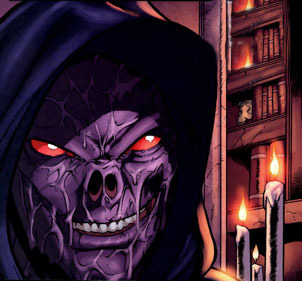 It was later revealed that Wulfgar was the demon's captive, and that Zaknafein was indeed dead. However, the priest Cadderly Bonaduce summoned Zaknafein's spirit and dispatched it to Drizzt. The fallen warrior told Drizzt what had happened to him, and expressed the pride and love he felt for his son before disappearing. World of Drizzt, ï¿½ 2008-present. All rights reserved. 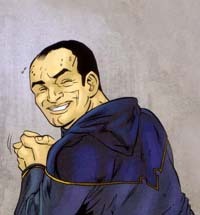 www.pauljustice.net. "Drizzt" and all elements are trademarks of and ï¿½ R A Salvatore. No copyright infringement is intended. All artwork copyrighted by their respective intellectual property holders.